How to Use this Keylogger to hack Facebook Password? First make sure you have ‘Microsoft’s .net Framework‘ installed on your PC, if you dont have please download and install it. [*] The victim need not have .net framework. 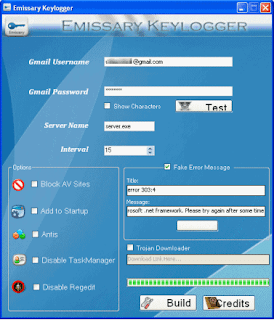 Step 1: Download ‘Emissary Keylogger‘ Software and extract the files to desktop. If your Antivirus deletes the file, then please turnoff your Antivirus or uninstall it and try downloading again. Step 2: Run ‘Emissary.exe’ file and enter your gmail account details, so that the password and other info of your victim can be mailed to you. If you are afraid of entering your gmail details, then do create one temporary fake account and enter those details. Step 3: After you enter your ‘Gmail account’ details Click on ‘Test’ to test the connection to your Gmail account. In the Server name Field you can change the name if you want. enter any Time Interval in the interval field. This timer controls the time interval between two keylogs emails. You can also show fake error message to your Victim when he clicks your server.exe file. to do so enter the error title and description in the ‘Fake error message’ field. Step4: Now after filling the required fields, Click ‘Build’ button. This will create another file called server.exe in the same directory. Step5: Now send this server.exe file to victim and make him install it on his computer. You can use Binder or Crypter to bind this server.exe file with say any .mp3 file so that whenever victim runs mp3 file, server is automatically installed on his computer without his knowledge. also read: How to change ICON of .exe file? [ * ] Now because this is a free keylogger, you can’t send server.exe file via email. Almost all email domains have security policy which does not allow sending .exe files. So to do this you need to compress the file with WinRar or upload it to Free File Storage Domains, like Mediafire, rapidshare, filethief etc. Step6: Once the victim runs your sent keylogger file on his computer, it searches for all the stored usernames and passwords and it will send you email containing all keylogs and screenshots regularly after the specified ‘Time interval’.